Search results for: "voyager 1"
Voyager 1 already had the distinction of being the man-made object that has travelled further from Earth than anything else we, as a species, have ever flung out into space, but that isn’t going to stop it from travelling deeper and deeper into the unknown. 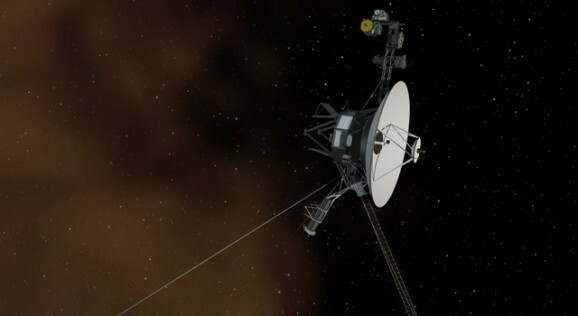 NASA confirms that the probe is indeed now travelling through interstellar space. Back in August of 2012, Voyager made international headlines when it was announced that it had actually left the heliosphere. This is essentially a giant bubble of magnetic fields and charged particles that surround our sun and extends far past Pluto. Plasma from the sun, so-called solar wind, pushes against the pressure of the interstellar medium, which is the hydrogen and helium mixture that makes up much of our galaxy. Interstellar space begins where the heliosphere ends. “It has been said that astronomy is a humbling and character-building experience. There is perhaps no better demonstration of the folly of human conceits than this distant image of our tiny world.” Carl Sagan wrote those words in his book Pale Blue Dot: A Vision of the Human Future in Space. It referred to the photograph that lent the book its name, a shot of Earth taken by Voyager 1. From a distance of some 3.7 billion miles, Earth looked like little more than “a mote of dust suspended in a sunbeam.” It’s one of those images that hammers home the sheer, awe-inspiring size of our cosmos, as well as our own fleeting existence when compared to the billions of years that stretch out behind and before us. The gorgeous short film Stardust, seen above, imagines our legacy carrying on, even if we do not, with Voyager 1 continuing its journey — and carrying the memory of us — long after our sun has died. 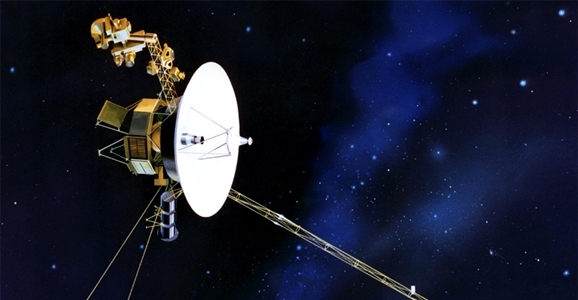 Voyager 1 has been journeying through space just longer than I’ve been journeying on Earth — 36 years. Now scientists know for sure that it’s the first man-made craft to exit our solar system and pass into interstellar place, having left the sun some 12 billion miles behind. For the past year, Voyager 1 has been traversing “star stuff” — ionized gas otherwise known as plasma. It’s currently free of the sun’s gravitational pull and out of the solar system, but not free of all effects of the sun. It no longer has to use sunscreen, though. The Voyager team is busy analyzing new data sent from Voyager 1 about the plasma it recently passed through and the space it’s currently traversing. Everything it registers is completely new, so scientists have a lot of work to do in terms of making sense of the information coming in, as well as figuring out what the new questions and gaps are. Like impatient kids in the back seat during a long road trip, scientists have been waiting in anticipation, asking “Are we there yet?” Finally, we are. Voyager reached the magnetic highway on August 25, which is more than 11 billion miles (18 billion kilometers) from the Sun. If you’re keeping score, that’s 122 times the distance from the Earth to the Sun. After 35 years of space exploration, NASA’s Voyager 1 satellite has reached the edges of our solar system. Voyager 1 has encountered a region that scientists are calling a “magnetic highway,” where charged particles take an “exit ramp” into deep space. 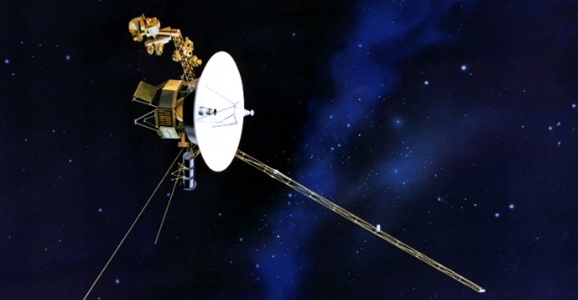 This is the last point before Voyager 1 enters interstellar space. This so-called “magnetic highway” is the region that connects the Sun’s magnetic field lines to interstellar magnetic field lines. This allows inner heliosphere lower-energy charged particles to zoom in and outer heliosphere higher-energy particles to stream into our solar system, which is why NASA is going for the highway metaphor. The heliposphere is the “immense magnetic bubble containing our solar system, solar wind, and the entire solar magnetic field,” according to NASA partner Johns Hopkins Applied Physics Lab. Apparently, the magnetic field orientation travels East to West and was once thought to travel North to South according to a few NASA astrophysicist. This is due to the Sun and winds from explosions of supernovae influence to interstellar space. The future of American space exploration may look more depressing than ever these days, between NASA budget cuts and a general disregard for science amongst chunks of the population. But the wonders are still out there, and amazing things are happening all the time if only we bother to pay attention. Case in point: Astronomy Now points out that the Voyager 1 spacecraft, launched by NASA back in 1977, is currently cruising along almost 11 billion miles from the Sun, on the threshold of entering the interstellar void. For the first time in history, a man-made object will leave our Solar System entirely. How cool is that?